As Kermit the frog said, “it’s not easy being green." The general public often views the trucking industry as a major contributor to pollution and a destroyer of the air and environment. Gas guzzling diesel engines are not viewed favorably in this world of environmental consciousness. Some consumers cringe at the vision of older model trucks hauling down the highway, belching black smoke. The trend of going green has been proliferate in many industries across the board, as the ideals of environmentalism are seen as more valuable to consumers and providers alike. Within trucking, there have been a growing number of fleets that place emphasis on a “green initiative” and often extol the virtues of going green. Despite their perceived popularity, an environmentally friendly trucking fleet can present a number of challenges. Although fleet managers may have the desire to make decisions that are best for the planet, a green fleet may require making decisions that are costly. Some companies may have trouble convincing the older guard of trucking that sustainability is a worthwhile issue for a trucking company to pursue. It may not sit well with older drivers to feel as though they are representing a company that promotes a “youthful” ideal, potentially making it hard to court the right drivers for a trucker job. When attempting to fill your trucks in a large state such as Texas, it’s important to cast as wide as net as possible without upsetting your audience, so to speak. However, going green can also bring with it some benefits for companies, drivers, and the world, all at the same time. Diesel emissions of nitrogen oxides contribute to the formation of ground level ozone, which produces watery eyes, irritates the respiratory system causing coughing, choking, and reduced lung capacity. Diesel exhaust has been classified a potential human carcinogen by the U.S. Environmental Protection Agency (EPA). Many believe going green is good step for the Earth and all its’ people. Here are some of the clear benefits to adopting environmentally sound procedures and making trucking jobs friendlier to the earth. In recent years, state and federal emissions and fuel consumption requirements have become more and more stringent. Some states like California with its Optional Low NOx Standards have extremely strict guidelines when hauling goods throughout the state in order to avoid fines and citations. Other states such as New York, Connecticut and Oregon are adopting these same tough requirements. In areas such as Florida, simply have adopted a standard across-the-board provision for trucks to comply with federal standards. By becoming proactive, trucking company fleets can take the plunge and get in front of these types of regulations by investing in equipment prior to the implementation of these measures. This allows the opportunity to stay a step ahead of the requirements and spread out the capital costs out over a longer period of time. This mounting evidence that this exhaust poses major health hazards has focused attention on the reduction of diesel pollution and made it a public priority. more than half of global consumers prefer to purchase products and services from a company with a strong environmental reputation. Green industry practices enjoy a favorable public sentiment. As environmental consciousness grows, business partners and their consumers are demanding more green products and services. It only makes sense that customers will favor a carrier that also makes green processes for their trucking jobs a priority in transporting their products. Anything that reduces fuel costs in welcomed by the trucking industry, no matter how big or small. The concept of reducing fuel consumption within a truck driving job also has the benefit of making companies less vulnerable when diesel prices soar. Old Equipment: Retrofitting and updating current trucking equipment are ways to boost fuel economy, save money in the long run and help preserve the air quality. For example, many add fairings to their big rigs, also known as trailer skirts. They reduce the aerodynamic drag on trailers and help prevent wind from ducking in under the trailer. This feature helps reduce the amount of energy exerted and the amount of fuel consumed. The support Environmental Protection Agency strongly endorses fairings and tucks that have this addition are often eligible for funding under the Diesel Emissions Reduction Act to help reduce cost to the carrier. New Equipment: Purchasing newer fuel-efficient is the ultimate way to go green. Although spending money on new technology may take a significant financial investment, analysts in the field promote the concept of operating trucks only to the point of economic obsolescence rather than functional obsolescence. In other words, when truck maintenance and fuel expenses are greater than the cost of a new, more fuel-efficient model, it’s time to retire the old truck.This may be expensive, but it is the most effective method to reducing millions of metric tons of carbon dioxide annually. 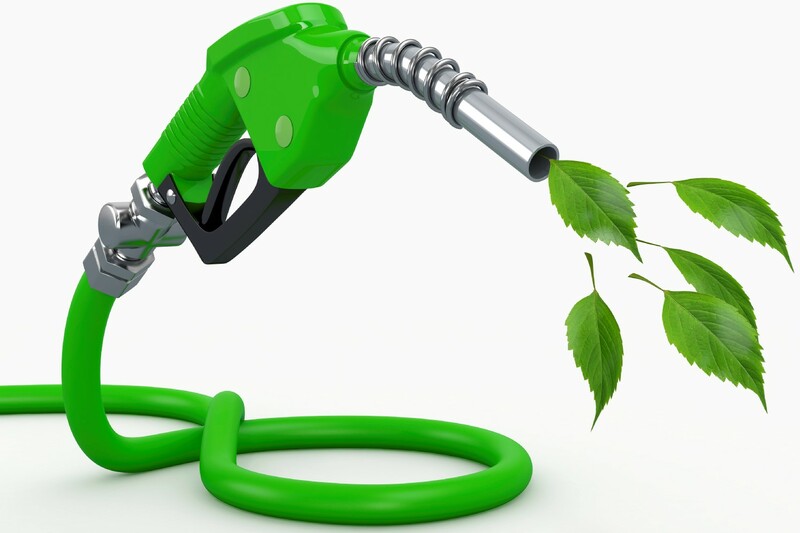 Tires: Fuel efficient tires have the potential of saving some operating costs. One option is wide-based tires that can reduce resistance instead of the traditional double tires. Low-rolling resistance tires minimize wasted energy as a tire rolls, thereby decreasing required rolling effort and improving vehicle fuel efficiency. 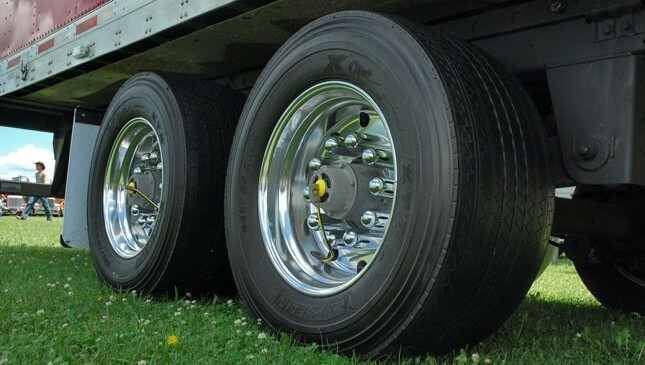 There are significant fuel savings to be had by specifying the right tires. A U.S National Highway Traffic Safety Administration(NHTSA) study found thatif 2% of the replacement tires would reduce their rolling resistance by 5%, there would be 7.9 million gallons fuel and 76,000 metric tons of CO2 saved annually. Yes, that is a lot of numbers, but also a huge reduction of pollutants. Maintenance: Preventative and basic maintenance are another way to get more miles per gallon and lower fuel costs. Regularly scheduled repairs and tests are a key component of maintaining minimum emissions and keeping the air cleaner. Speed. Limiting the top speed of trucks on the highway can help increase fuel savings. Just dropping speed by 10 miles per hour save will save a considerable amount. The EPA Smartway Program recommends that the national speed limit be set to 65 miles per hour, and that truck governors be installed (devices that are designed to limit the moving speed of the vehicle) to limit fuel consumption. Idling: Minimizing idling is a smart strategy to help protect the environment from unnecessary emissions.Fleet managers should remind drivers old and young that leaving the truck running for extended periods of time when it is unnecessary to do so waste fuel, adversely affecting the environment and the company’s bottom line. Vehicles equipped with GPS capability can now uncover opportunities to improve efficiency and reduce fuel expenses. Technology also allows for the consolidation and shipping full truckloads when possible, saving time, money and unnecessary vehicles on the highways. Change doesn’t come easy to all drivers. The average age of a commercial driver in the U.S. is 55, according to the Bureau of Labor Statistics. Some older, seasoned drivers are skeptical that these and other changes could improve fuel economy and reduce emissions from tractor-trailers. A younger generation, raised with recycling and global warming, is more easily accepting to the changes in equipment and regulations. Education and knowledge is the key to acceptance to the benefits of a green focused company that puts value in supporting the planet as well as commerce. Manufacturers are always searching for new and innovative solutions to find a balance between efficiency on the road, environmental considerations and cost.Alternative fuels are always at the top of creating a better truck for the environment.For example, BMW was the first to develop an electric 40-ton truck, but it can only go 60 miles on a charge. Natural gas-powered trucks are slowly making headway, but there are hurdles to get over. Acceptance by drivers, the mechanics and especially the cost, which some industry experts cite as $25,000 to $50,000 more for a natural gas-powered sleeper tractor are all barriers. Companies that focus on reducing energy consumption not only help the environment, but also reduce their costs and gain new and loyal customers as well. There is clearly a direct relationship between environmental sustainability and financial rewards. Protecting the environment and reducing energy consumption is no longer a fringe movement, but rather a mainstream concern. And while fleet executives know that going green does provide societal and environmental benefits, the biggest benefit to carriers are those that save money in fuel and other costs.